The transportation sector accounts for about one third of greenhouse gas emissions in the United States.8 In 2008, the United States had over 250 million registered motor vehicles that consumed a total of 136 billion gallons of fuel.9 Use of air conditioning in cars decreases fuel economy and increases tailpipe emissions of greenhouse gases and air pollutants, contributing to global climate change and smog formation in cities. Cool cars can benefit drivers, cities, and the planet. Fuel savings. Substituting a cool shell for a conventional black shell permits the use of a smaller air conditioner, improving fuel economy by 1% (for a cool colored shell with 35% solar reflectance) to 2% (for a white or silver shell with 60% solar reflectance). Better air quality. Specifying a smaller air conditioner reduces tailpipe emissions of nitrogen oxides, carbon monoxide, and hydrocarbons. Slowed climate change. Specifying a smaller air conditioner reduces tailpipe emissions of carbon dioxide. Cool car shells also reduce the flow of heat from vehicle to atmosphere. 8 EPA 2011. 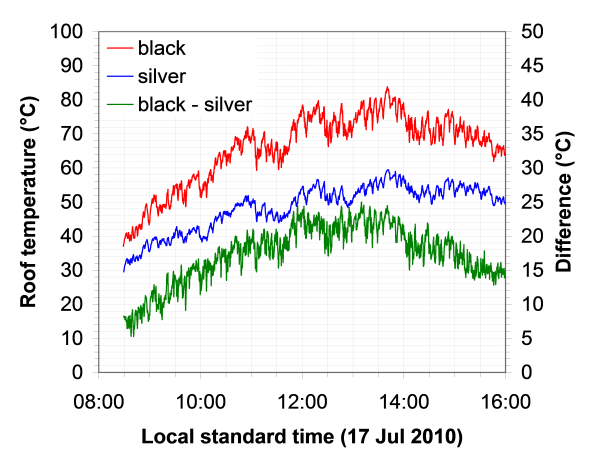 Inventory of U.S. Greenhouse Gas Emissions and Sinks: 1990-2009. Table ES-8, Table 2-15. 9 Federal Highway Administration 2008. Highway Statistics. U.S. Department of Transportation. Washington, D.C.
10 Levinson R, Pan H, Ban-Weiss G, Rosado P, Paolini R, Akbari H. 2011. Potential benefits of solar reflective car shells: Cooler cabins, fuel savings, and emission reductions. Applied Energy.